Every day I’m finding there is one more thing my kids can do, and want to do, without me. They will scramble up the stairs and tunnels at the indoor playground without needing a boost. Or play quietly together without needing a referee. Recently they figured out the water dispenser on the fridge and no longer need me for hydration as long as a cup is within reach. I love their independence. It makes me feel proud that they are going from “I do it myself” to actually doing it themselves. That’s what parenting is all about right? Giving them roots and wings. But at the same time, I don’t mind helping start the zipper, or unbuckling a bike helmet, or opening the apple sauce jar. In fact, please let me open the apple sauce jar… I beg of you. And I really don’t mind when my littlest is just a touch too short to go on the rides without an adult. 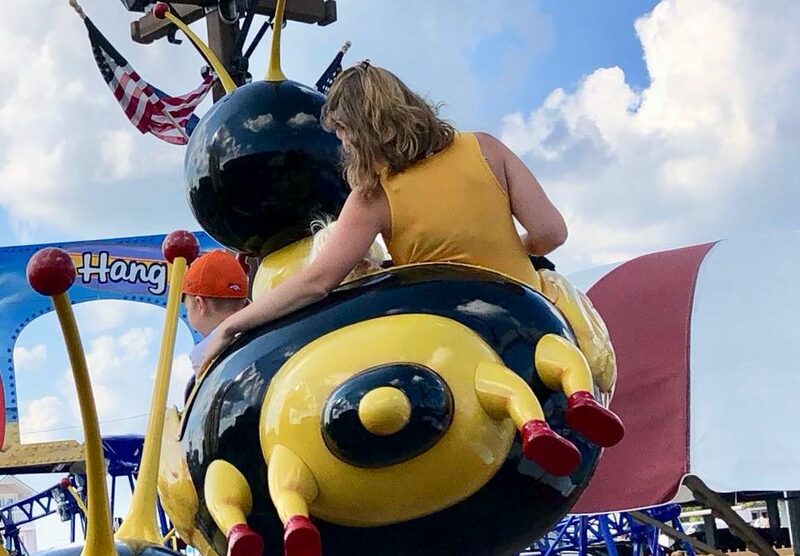 Because that means I get to fly on the bumblebee too, and experience childhood not by looking at them, but by looking with them. So if I can, I’d like to hang onto that for just a little longer. To live in the little kid big kid in between. The “go for it, but I’ll be here if you need me” place. The “you’ve got this, but I can catch you if you get scared” place. The sweet and fleeting period of time in which I get to watch them learn to fly, and fly right alongside them.